This Fiesta Guacamole is inspired by a cozy little farm stand in New York’s East Hampton. The market, affectionately known as Round Swamp Farm, is a beach lovers dream. The produce is always fresh and the prepared food for beach picnics and easy dinners are delicious. The farm sells a version of guacamole loaded with fresh corn that both surprised and delighted my family so much that I decided to create a version of it at home. In my version of the farm’s “Fiesta Guacamole”, I use sweet, crunchy summer corn (sliced right off the cob) twirled into a chunky avocado pudding. I actually chose to leave the corn raw because this time of year the corn is so sweet and fresh. Then I veered in my own direction and tossed in fine ribbons of fragrant summer basil, and a handful of perky, farm stand cherry tomatoes. I found the basil added an unexpected twist, and leaving the cherry tomatoes quite large (sliced only in half, really) added a decidedly elegant farm stand flare. When everything is then tossed together, and punched up with fresh lemon juice and a pinch of good sea salt and pepper, I found the quality of the ingredients alone took this summer staple to the next level. I made this guacamole for one, but it can easily double and triple to accommodate a group. 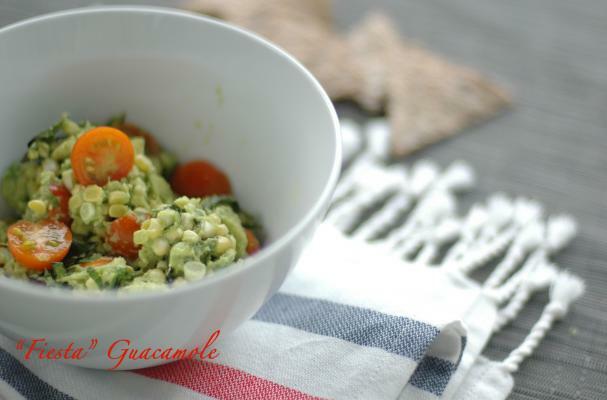 I love to enjoy this guacamole with a handful of crunchy carrots, as well as scooped onto a few crunchy chips. It’s also fabulous scooped on top of a simple green salad. Avocado – Avocados are packed with nutrients (including B vitamins, as well as beta-carotene, magnesium, and vitamins E and K) and are helpful in supporting glowing skin, radiant energy and strong bones. They are also a great source of glutathione, a powerful antioxidant that fights unhealthy free radicals. Cut the avocado in half and remove the pit. Scoop the flesh out of the shell and into a bowl. Using a fork mash up the avocado until you have a chunky paste. Add the lemon juice, corn, tomatoes, basil, lemon, garlic and jalapeño. Gently toss. Add a pinch of good sea salt and pepper to taste. Looking for more simple and delicious ways to enjoy avocados? Give these recipes a try! This Epic Avocado Dressing is also a favorite of mine.